The Boston Marathon bombings on 15 April 2013 shook the US, killing three and injuring dozens more, and sparking a man-hunt that shut down parts of Boston during the following days. By the end of the week the two time the suspects had been identified, one had been killed, and the other captured – and technology had played a significant role – good and bad – in the events, rather a number of social and ethical issues that are directly related to ITGS. Almost immediately after the attacks, police began to gather hundreds of hours of CCTV footage from local businesses and TV crews in an attempt to piece together the day’s events and identify suspects. The FBI also appealed to the members of the public to submit their photos and videos of the marathon to aid their investigation. Citizen’s images have played significant roles in reporting major news events before (such as the September 11, 2011 terrorist attacks and the 2005 London bombings – where passengers provided the only images of the bombed London Underground tunnels). Images taken by members of the public were also used in identifying those involved in the 2011 riots in Vancouver, Canada. Facial recognition software, which compares photographs of individuals to photographs stored in police databases, has been used in a number of situations including the 2001 Super Bowl (where fans were photographed as they entered). The technology was also used on images of the 2011 riots in London, and was proposed for the 2012 London Olympics. Facial recognition systems can achieve up to 99% accuracy on good quality still images such as those taken for police mugshots, those taken with high-quality digital CCTV cameras, or images produced as people pass through stadium turnstiles. However, most of the images and videos available to the FBI in Boston were of low quality, taken from a wide variety of angles, and taken under widely varying lighting conditions. Added to this, facial recognition systems perform poorly on photographs of people wearing hats or sunglasses, as the eyes are used as a key marker in producing a biometric template. These factors meant the process of analysing the Boston Marathon footage was very much a human task. For these lower quality images, technology can only really act as an ‘initial filter’: automatic image processing software can group footage that contains the same person, based on their form, gait (walking style), and the colour of their clothing, and use image meta-data to put footage into chronological sequence. This is particularly helpful once police have identified a possible suspect and want to view his movements throughout the day. 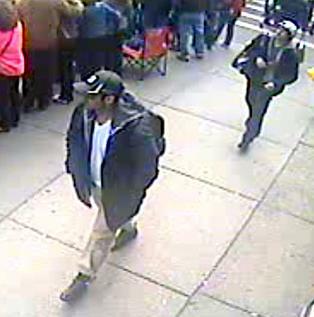 On 18th April, three days after the bombings, the FBI released images of two men who they suspected of involvement. The images, taken from CCTV, were quickly spread on social media sites, including Facebook, Twitter, and YouTube, in an attempt to ascertain their identities and whereabouts. This suggested that the men were either previously unknown to the authorities, or that the images were too low-quality to be matched by facial recognition systems. 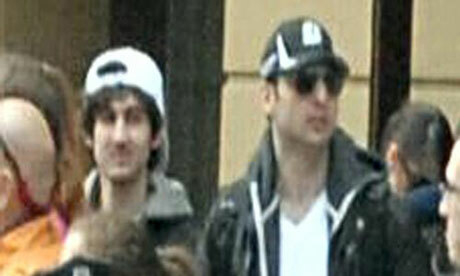 The two men were quickly identified as Tamerlan Tsarnaev and Dzhokhar Tsarnae. There was, however, a darker side to such ‘crowd-sourced’ online investigations. In the days after the Boston bombings, before the FBI released images of the suspects, online users – particularly on the news site Reddit – swapped theories and suspicions about possible culprits. Pictures of several different spectators were posted online, often identified by users as ‘suspects’ based nothing more than ‘not looking at the race’ or ‘wearing a backpack’. Such crowded-sourced investigations clearly raise a number of ITGS social and ethical issues. In particular, the risk of false information and the potential impacts such as vigilantism and mob justice. Once Reddit user claimed the networks were simply fuelling racism and anti-Islamic sentiment in the name of ‘investigation’ and did more harm than good. One innocent man, identified by these users as a ‘suspect’, was Salah Barhoun. He found image spread across the Internet and even appearing on the front page of the New York Post. Although the newspaper later apologised and said there was no evidence linking Barhoun to the crime, online users had already shared information about Barhoun’s address and he said he feared for his life. Even after the FBI released images of the suspected bombers (which was in part to stop the spreading of misinformation online), social media users continued to erroneously identify innocent people. 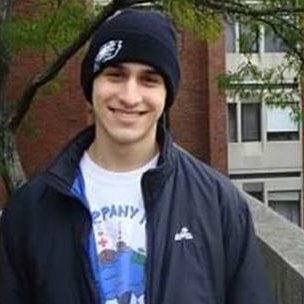 22 year old Sunil Tripathi, who had been missing since before the attacks, was one such person. Already distraught over his disappearance a month earlier, Tripathi’s family had to endure hours of allegations against their son until the FBI released the names of the actual suspect. The situation worsened when many Twitter and Facebook users spread Tripathi’s name and photo, believing him to be an official suspect. Tripathi’s body was later found in the water off Rhode Island, although it is not known whether his death was related to the allegations made against him. A more positive use of social media and Internet technology in the aftermath of the bombings was the rapid setting up of funds to help victims. The American Red Cross, The Boston Police Foundation, and several other charities quickly set up pages allowing citizens to donate money securely online. This was particularly helpful in the days after the attack when parts of Boston were on lock-down as the manhunt for the suspects progressed. Unfortunately, as with many major news events, spammers were also quick to take advantage of people’s thirst for news. Within a very short time spam email infected with malware was being distributed across the Internet – an important reminder to always follow common-sense computer security practices (including never opening email or attachments from unknown users), and only donating money to reputable online charities whose identify and security is authenticated in your web browser. In the future, artificial intelligence systems may be developed that are not only able to identify potentially malicious people, but also potentially malicious actions. This means police could use so-called SmartCCTV systems to identify a potential bomber even if he were not already known to them. Such systems could, for example, be trained to recognise human behaviour such as putting down an object like a backpack, or using a cell phone. Such a system would be trained to recognise normal behaviour in public events, and highlight anything which strayed from this: such as walking away from the backpack, or dialling a number into a phone but then not holding the phone next to your head (mobile phones can be used to trigger remote bombs). Indeed, the FBI identified Tamerlan Tsarnaev and Dzhokhar Tsarnaev as suspects in part because of their abnormal behaviour: after the bombs exploded, they watched the aftermath before walking ‘casually’ away, at a time when everybody else was running to safety or running to assist the victims. This led investigators to search backwards through images of the pair’s movements that day until they found footage of them dropping the rucksacks which contained the bombs. In the future, such behavioural analysis could be applied automatically by software. The Future: Drones for next marathon? Since the Boston bombings, Police Commissioner Edward F. Davis has called for increased surveillance technology – including the use of police Unmanned Aerial Vehicles – commonly known as drones.Armed drones such as the Reaper and Predator are commonly deployed over Iraq and Afghanistan, but the use of unarmed versions by American police departments has been hotly debated. However, despite the concerns about the violation of citizens’ privacy, New York Mayor Michael Bloomberg has also said police use of drones in the US is ‘inevitable’. Drones can stay airborne for hours at a time and are significantly cheaper to operate than helicopters. They also have the advantage of being invisible from the ground, making it harder for suspects to know when they are being watched, but increasing concerns over privacy.